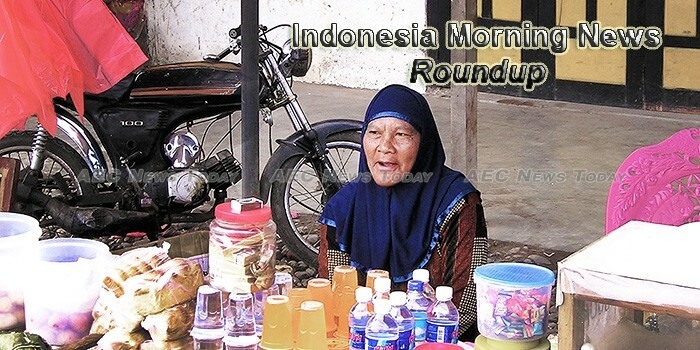 Welcome to the Indonesia morning news roundup by AEC News Today, your one stop for Indonesia news on matters of governance and policies affecting Asean business communities. The prospect that Australia and Indonesia would jointly patrol the South China Sea near Natuna Islands has been slapped down by Foreign Minister Julie Bishop, who denied reports the Indonesian President had ever suggested it. Indonesia’s coordinating political, legal and security affairs minister Wiranto said that rising radicalism and terrorism are problems that Indonesia and Singapore should prioritise and work together to fight. The Ngurah Rai International Airport in Bali and Sultan Hasanuddin International Airport in South Sulawesi have received prestigious awards from the Airport Council International (ACI). Ten years after the Garuda crash that killed five Australians, an aviation expert warns Indonesia’s industry needs to shape up or there will be more tragedies. The local arm of the Royal Bank of Scotland NV (RBS NV) has officially ended its business in Indonesia. Indonesia’s central bank will manage the rupiah’s movement in case of currency market volatility ahead of a Federal Reserve meeting on March 14-15 that is widely expected to key raise U.S. interest rates, the bank’s governor said on Monday. Vice President Jusuf Kalla said that only rich and “rogue” states could gain world attention; therefore, Indonesia must be a developed country to get global attention. New regulations on power purchase agreements in the Indonesian energy market are raising concerns for geothermal developers, due to the requirement for PLN to only purchase power in accordance with proven reserves after exploration. A NEW Zealand man on holiday in Bali was reportedly kidnapped for hours and forced to play a card game that swindled him out of $2000 in what appears part of a scary scam targeting tourists on the holiday island. Indonesia has expressed its wish to integrate its maritime axis program with shipping lines within the Indian Ocean Rim Association (IORA) area, as part of efforts to boost economic cooperation between the association’s countries. As the United States’ Federal Reserve inches closer to a second rate increase, Indonesia is preparing to build a cushion against capital outflows that could trigger volatility in the domestic market. The results of two recent surveys reveal a strange contradiction in the attitude of Indonesians towards corruption, with a CSIS poll showing from 2016 showing that a majority of Indonesians thought that corruption in the country was getting worse while the 2017 Edelman Trust Barometer survey that Indonesians had an unusually high level of trust in the government, especially compared to other countries with far less perceived corruption. Rotana, one of the region’s biggest media networks, has launched three television channels dedicated to the Indonesian market. FINNET, an Indonesian electronic payment provider and member of Telkom Group, signed an agreement with Cellum at the Mobile World Congress in Barcelona. Grab has recently launched its master plan for Indonesia – one which entails a $700 million investment into the largest economy in Southeast Asia to battle its fiercest competitor, Go-Jek, and the first priority under this will be to build an R&D center with 150 engineers, Ridzki Kramadibrata, the ride-hailing app’s managing director in Indonesia, said in an interaction. Advisory Council observer and chairman of the Committee on Interior and Foreign Affairs Mohamed bin Abdullah al-Sulaiti received a delegation from the Indonesian Parliament, led by the head of the First Commission of the House of Representatives, Dr H Abdul Kharis Almasyhari, in his office recently. The government should deliberate the bill on tobacco proposed under the initiative of the House of Representatives, a senior official of the Ministry of Industry stated. Energy and Mineral Resources Minister Ignasius Jonan said the government is set to finish electrification program in Papua and West Papua in 2018 using solar power plants to dismiss darkness at night in the villages in the countrys easternmost provinces. Dian Permata Sari was determined to escape when she was brought to the maid recruitment office in Saudi Arabia for the sixth time and paraded in front of potential employers alongside 14 other women. Heavy rain in several areas of the country over the past days has caused floods and landslides. Is ‘Manis’ the sweet deal that brings Australia and Indonesia together? When Saudi King Salman emerged earlier this week from a Boeing 747 that is bigger than Air Force One onto a specially made escalator and descended onto the tarmac of the government VIP terminal in Jakarta, the irritations that have dogged relations between the kingdom and the world’s largest Muslim majority all but evaporated. Coffee Production of Indonesia to Rise or Fall in 2017? Production of coffee in Indonesia is estimated to grow around 10 percent to the range of 650,000 – 700,000 tons in 2017, says the Indonesia Coffee Exporters Association (GAEKI). In 2015 Indonesia’s coffee production is estimated to have fallen to 600,000 tons due to the impact of El Nino, a weather phenomenon that brought dry weather to Southeast Asia hence plaguing harvests of agricultural commodities. GAEKI Chairman Hutama Sugandhi added that Indonesia’s coffee export performance also declined in 2016. Liberty University says a student drowned while studying abroad in Indonesia. Assigned by His Majesty Sultan Qaboos bin Said, Dr. Yahya bin Mahfoudh Al Mantheri, Chairman of the State Council left here on Monday heading to the Republic of Indonesia to lead the Sultanate’s delegation in the Indian Ocean Rim Association (IORA) Summit, due to be held in the Indonesian capital, Jakarta. Cowper MP and Assistant Minister to the Deputy Prime Minister, Luke Hartsuyker, spent today in Bader Lampung, Indonesia, promoting Australia’s world-class livestock export industry and “gaining a valuable insight into the operations of the cattle industry in Indonesia”. Indonesian academics are learning more about feeding, animal health and breeding of cattle at Massey University’s Palmerston North campus. The Indonesia morning news roundup is published M-F by AEC News Today: Governance, not government; policies not politics.